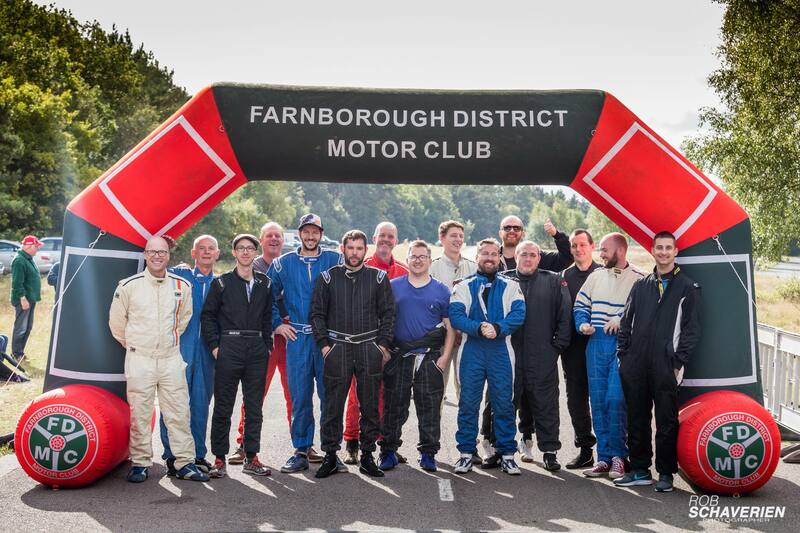 15 members of the Isle of Wight Car Club joined the Farnborough and District Motor Club at the at their Sprint Royale on the 8th of October. The connection between the FDMC and the IOWCC started back in the summer of 2017 when the island hosted a round of the Southern County Autocross Championship. So they could compete at this island event, many members of the IOWCC joined the MSA and obtained their class B licence, purchased the regulation helmet, overalls and gloves. The Isle of Wight Autocross was a complete success and it looks like the island will become a destination in the years to come for future events. Now armed with the necessary licence and safety equipment to compete in MSA speed events, the IOWCC became an invited club at the FDMC Sprint Royale. The up take for this event by IOWCC members exceeded all expectations and the range of cars that members competed in were varied and included everything from standard unmodified MX5s to highly modified production cars, stage rally cars and a smattering of LoCost circuit racing specials. Many members had never competed in such an event before and the FDMC made every effort to ensure all that took part had a positive first experience of sprinting. The IOWCC also produced some pleasing results at this event. Mike Hughes placed 10th overall and 2nd in class 8 in his Lotus elise. Toby Allan placed 9th overall driving his highly modified MX5 and won class 5 with a substantial lead and finally Steve Wells in his Locost won his class and came 5th overall. This was a fantastic achievement and he was only stopped from placing higher by much more powerful machinery that included 2 Radicals, a Nissan GTR and a monster of a Mitsubishi EVO 6. With the seeds now firmly sowed and the interest in speed events growing within the IOWCC, I can guarantee there will be many members campaigning at sprints and hill climbs throughout the country in 2018 and the IOWCC are continuing to look into the feasibility of running their own speed event on the Isle of Wight. The Isle of Wight Car Club would like to thank the Farnborough and District Car Club for all their support in 2017 and look forward to further motor sport links together in the future. Round 10 being an USS event was originally scheduled to be at the ever popular Atherfield, however, due to a very wet start to autumn the flat grass field became flooded and a last minute venue change was required. Thankfully the owners of Knighton sandpit are always accommodating and the day was saved. With the bad weather and change of venue, the number of competitors was a little disappointing but the competition and action was still fierce. Josh Finch was the only car in class 2 and was driving his MGF, gaining 50 class points and 42 overall points. Josh not only enjoyed a day of grass roots motor sport but also went home with plenty of points towards his championship total. Marion Brett and Steve Brett were also the only competitors in class 3, however not the only classic mini, as Dan Young was campaigning his newly acquired class 5 autocross classic mini. Steve Glass should have also been in class 5 in his highly anticipated rear engine Fiat Cinquecento, however, quite wisely chose not to perform its initial shake down at Knighton. Instead he used his trusty Toyota Corolla, he was joined in class 4 by Steve Wells sharing Ricky Sheppard’s 205, with the latter claiming class honours. Chris Lee struggled to master the twisty course in his class 5 special and incurred quite a few wrong tests for not driving around the course in the right order. He went, however, not as spectacularly wrong as Dan Young who after queuing up and watching (or apparently not) each car start ahead of him turn left, he turned right. As funny as this was for the spectators Dan soon mastered the course and was challenging Andy Williams in his class 5 special for the overall lead of the event. Not a single competitor finished the day without either a wrong test, time penalty or a DNF and every point was hard earned in these challenging conditions. After the final run, Steve Brett took possession of the 3rd step of the podium with Andy Williams in 2nd. Dan Young wowed his peers by taking his first event win with an astonishing 1.43 second lead and celebrated by drinking his Champagne from his wellington boot. The next event is also the final Unsealed Surface event of the year and will also be held at Knighton Sand pit on the 22nd of October.